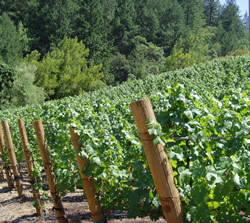 Our Vineyards are located in the Northeast corner of the famed Diamond Mountain District in the upper Napa Valley. At this scenic Location of just under fourteen acres, the Bianco family has been making wine for over three decades. The District is renowned for the elegant character of the wine produced from its soils and is particularly suited for growing the premier grape of Napa Valley Cabernet Sauvignon. 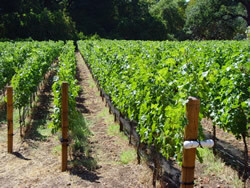 Under the direction of vineyard manager Mario Bazan, whose reputation was established at world famous vineyards in Atlas Peak, Oakville and the Rutherford Bench, two one acre parcels were planted exclusively with specially selected Clone 4 Cabernet Sauvignon vines grafted onto 420A rootstock. This heritage clone was chosen because of its unique characteristics - small berries, intense character and sparse yield – ideally suited for our specific microclimate and singular terrior. The result of this marriage has been wines of distinctive elegance. This small parcel is located on the eastern slope of the property where it receives full sun from sunrise to late afternoon. The soil of the Hillside Vineyard is primarily composed of volcanic rock and gravel of various sizes and in various stages of decomposition. It was a particularly difficult site to plant and though the vines struggled in this inhospitable environment, the effort was worth the reward. The resulting fruit possesses all the distinctive characteristics one seeks in a premium Diamond Mountain Clone 4 Cabernet. The Hillside Vineyard is pruned in single-cordons with rows running up and down the Hillside rather than being terraced. The soil of the Creekside Vineyard is primarily porous clay and volcanic gravel. The depth of these soils affords ample drainage which allows the nutrient seeking roots to draw deep into the soil. The microclimate of this vineyard is markedly different as it is in a cooler location than the Hillside Vineyard. The River Willows, which line Cyrus Creek at this location provide shelter from the intensity of the late afternoon summer sun allowing the soil to cool. This environment affords a longer ripening cycle, which enhances the balanced fruit and elegant flavor and texture of the wine. This vineyard is also single-cordon pruned.